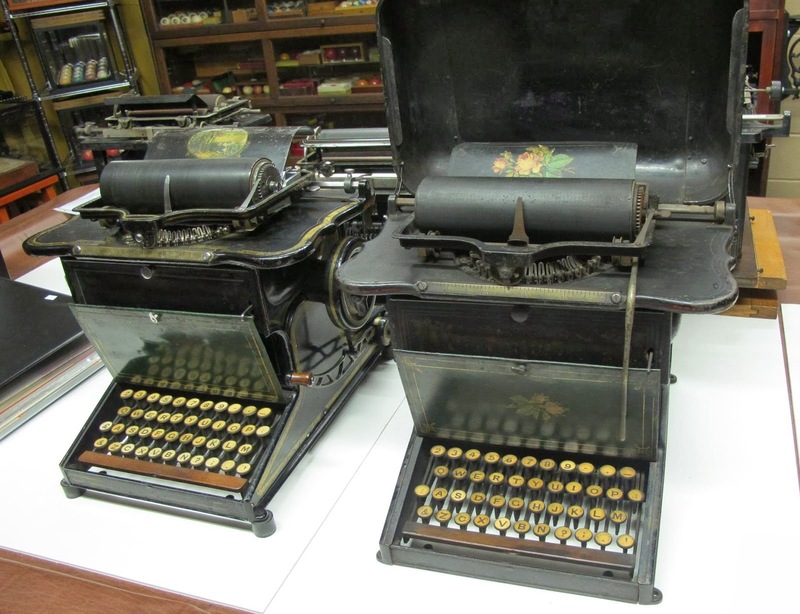 In what was probably the typewriter sale of the year, a 1875 Sholes & Glidden, seen above on the right, sold in an eBay auction in the US for $US20,230 on January 21. That's almost as much as the entire proceeds from the Emeric Somlo Collection auction (featuring some 90 typewriters) held in Melbourne last month! The photograph above was taken in what are to me now familiar surroundings - Herman Price's Chestnut Ridge Typewriter Museum in Fairmont, West Virginia (the S & G was auctioned in Falling Waters, West Virginia). Herman's S & G is seen on the left. 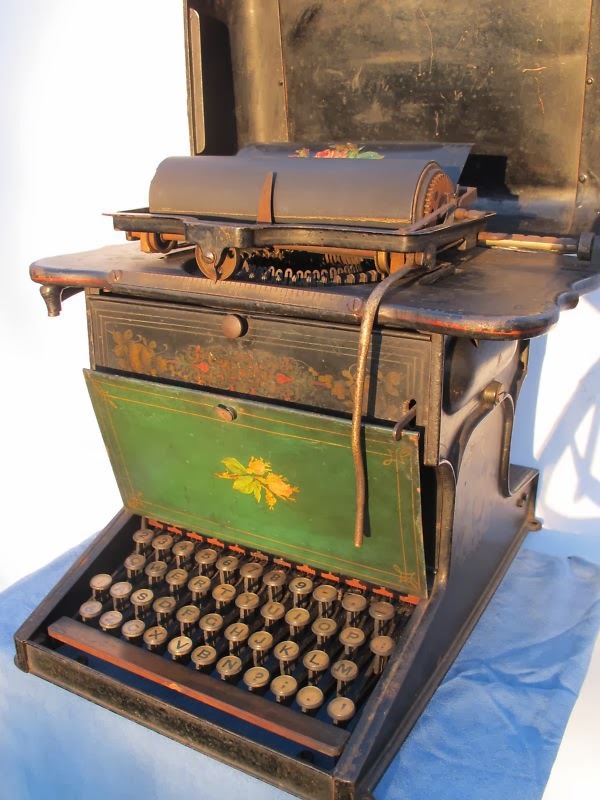 The auctioned S & G was originally owned by Samuel Lee Condé (1837-1919), a Civil War veteran, lawyer, doctor of divinity and church minister who patented three typewriter designs in 1894 and three typewriter cabinet designs between 1892-94. From the oldest to the newest. 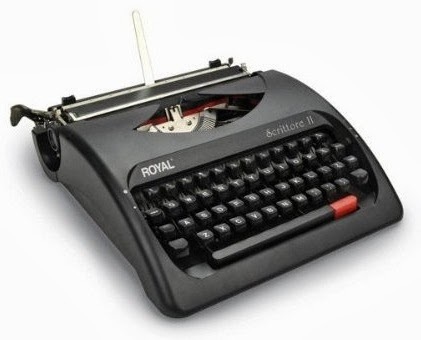 In February, Adler Royal introduced the latest brand-new typewriter available on the market, the Chinese-made Royal Scrittore II. It is no more or less than the Scrittore I in a Olympia Traveller C mask. The original design was done by Reiner Kieling for Olympia back in 1990, thus the Adler brand name has become attached to an Olympia design! 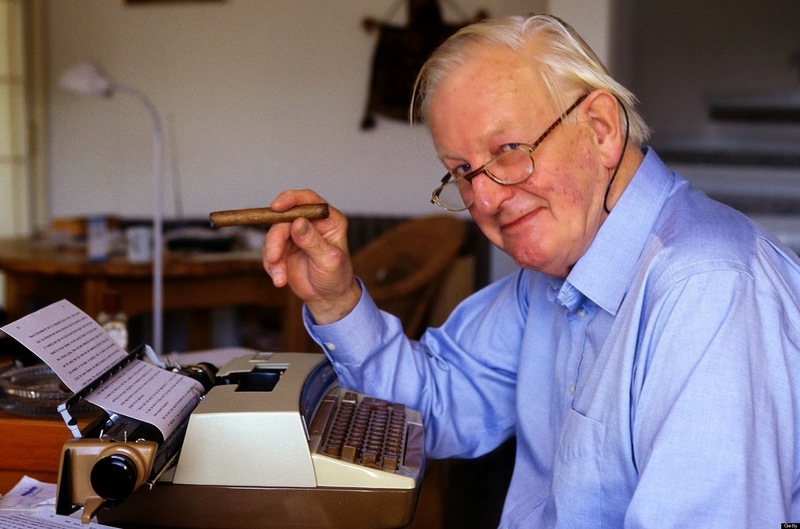 Once the greatest of German typewriter-making rivals, now bosum buddies? 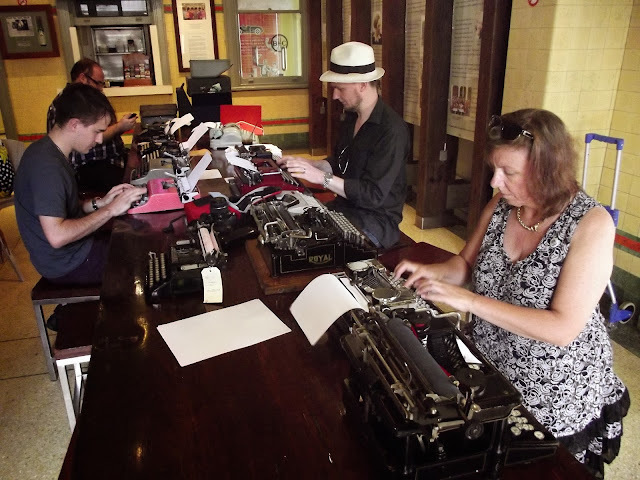 One of the two major highlights of the year for me was my trip to Queensland in early March, primarily to attend the first-ever Australian Type-In, held at the Breakfast Creek Pub in Brisbane on March 10. The event was organised by Scott Kernaghan and was also attended by, among others, fellow Typospherians John Lavery, Steve Snow and Rino Breebaart, all of whom I was delighted to be able to meet for the first time. Steve, at a pink Olivetti Lettera 22, and Rino, at a burgundy Everest, can be seen above. Kate is at Scott's Royal, which I had chromed in Canberra and gave to Scott on his visit here for the Typewriter Exhibition last year. 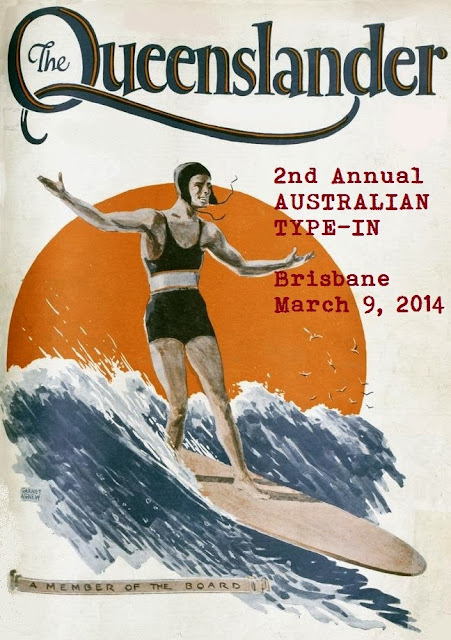 As of last weekend, a second Australian Type-In is in place, and will be held (again in Brisbane) on March 9, 2014. Apart from the usual suspects (Scott, John, Steve and Rino), Natalie Tan has confirmed she will be travelling from Darwin in the Northern Territory, I will be there from Canberra and Steve K is hoping to be able to make it across from Perth, Western Australia. It should be another memorable event. Natalie surfs in from the Top End with her teal Favorit. 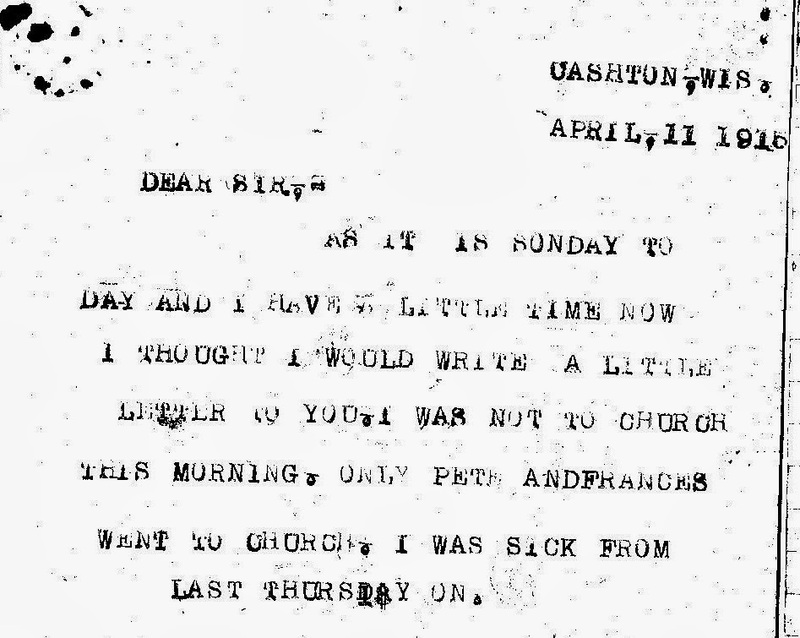 No way to treat a typewriter. 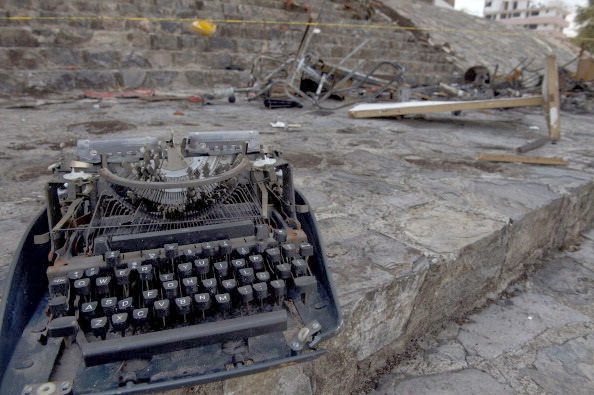 This was what left of the machine used at the local headquarters of the ruling Institutional Revolutionary Party (PRI) in Chilpancingo, the capital of Mexico's Guerrero state, after a "demonstration" on April 25. Teachers, angered at education reform, stormed the offices of political parties in south-western Mexico, breaking windows and setting fire to the ruling party's local headquarters. Thousands of members of the CETEG teachers' union, joined by farmers and student groups, marched in Chilpancingo, while groups wearing masks took their anger out on the offices of four political parties. How to treat a typewriter - with all due respect. 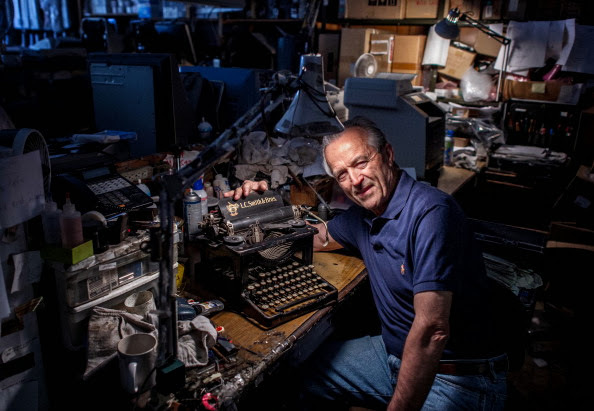 Busy Beverly Hills typewriter repairman Ermanno Marzorati gained much well-deserved international exposure after an AFP picture story was published around the world in late May. He is seen here servicing a 1930 Underwood for Tom Hanks. 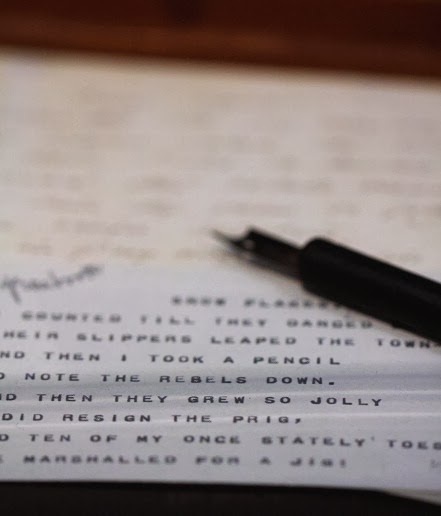 Marzorati has restored typewriters belonging to Ian Fleming, Tennessee Williams, Jack London, Ray Bradbury, Ernest Hemingway and Orson Welles, as well as celebrities like Julie Andrews, Greta Garbo and John Lennon. 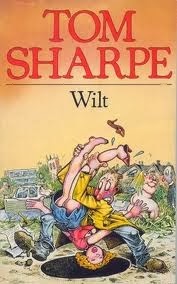 One of my all-time favourite writers, English satirical novelist Tom Sharpe, died in Llafranc, Catalonia, Spain, on June 6, aged 85. The photograph above was taken at his home in Spain in 1997. Sharpe will be best remembered for his Wilt series, as well as Porterhouse Blue and Blott on the Landscape, which were both adapted for television. In the wake of a US surveillance scandal sparked by whistleblower Edward Snowden, in July Russia adopted "a foolproof means of avoiding global electronic snooping". 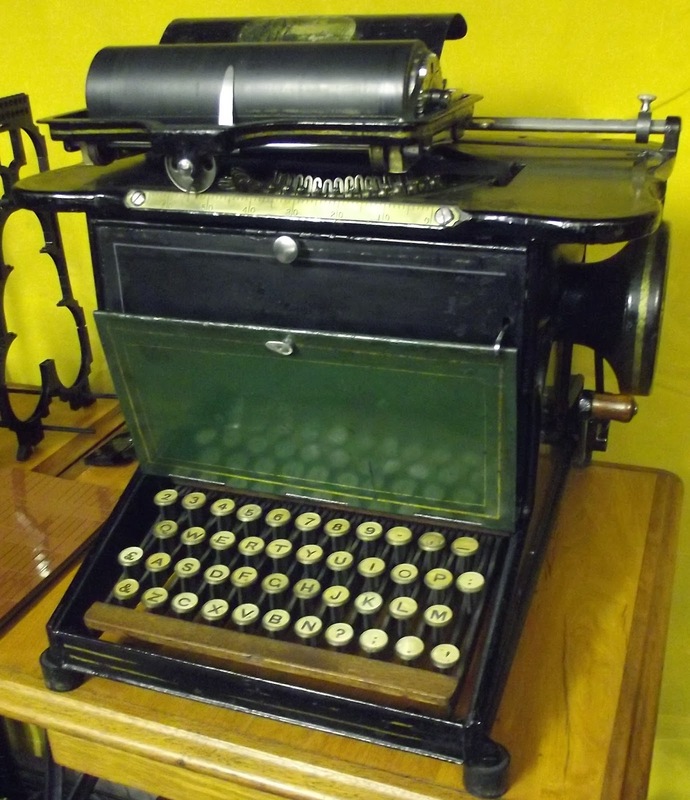 The Federal Guard Service (FSO) put in an order for 20 Triumph Adler T 180 typewriters, spending 486,000 roubles. 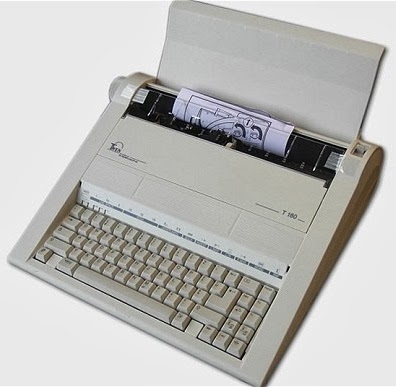 Claims at the time that these typewriters provided an individual "fingerprint" were nonsense, however, since "wedge" electronic machines produce a completely even print. 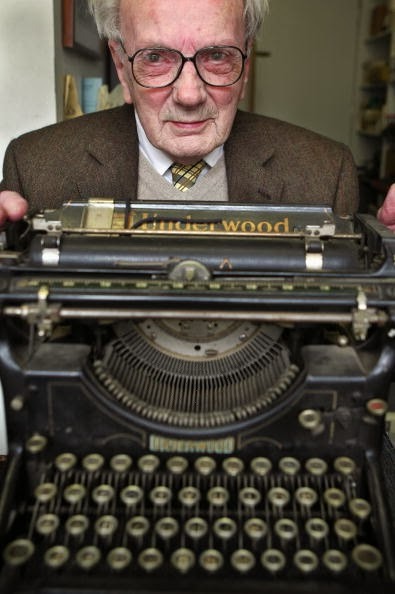 August 28 was a sad day, with the passing, at the age of 96, of famed Bethany, Connecticut, typewriter repairman Manson Hale Whitlock. Many Typospherians mourned the loss. A few, like Richard Polt and John Lambert, had happily had the chance to met Mr Whitlock during the latter part of his life. 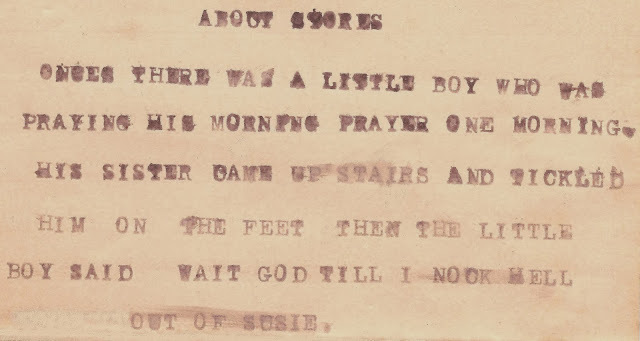 The typewritten version of Emily Dickinson's poem Snow Flakes (seen above) was apparently typed sometime between 1887 and 1896 - possibly (as it is in sans serif caps) on a Sholes & Glidden? 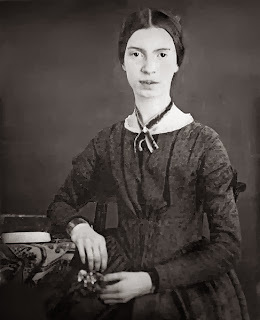 The typed version is held by the Emily Dickinson Museum in Amherst, Massachusetts, where it was photographed in early September. 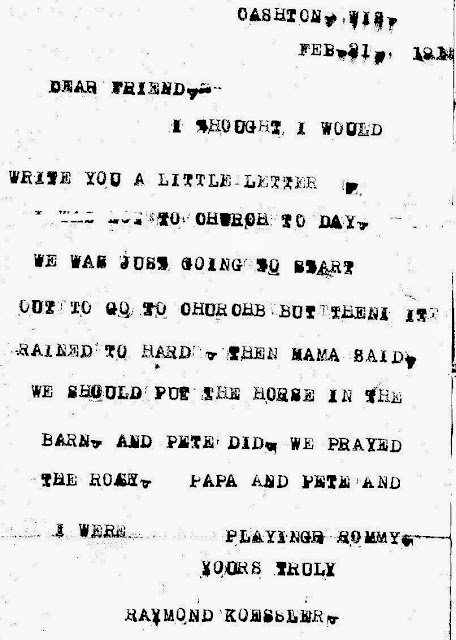 Nine months after Dickinson's death (which occurred on May 15, 1886), editor and writer Mabel Loomis Todd bought a typewriter and asked Dickinson's younger sister Lavinia Norcross Dickinson if she could "type up three of Emily's poems to see what they looked like in print". 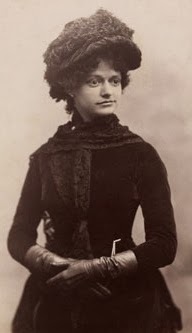 Lavinia, who had found Emily's work after her sister's death, agreed. According to Todd's journals and diaries, "every few days, she typed up a few of Emily Dickinson's poems". Eventually Lavinia decided Todd should edit the poems. "Lavinia began to take over baskets full of Dickinson's manuscripts and dump them in front of the fire in Todd's home." Few of Dickinson's nearly 1800 poems were published during her lifetime. However, she is now almost universally considered to be one of the most important American poets. Herman Price, Richard Polt, Dennis Clark, Jim Rauen and Peter Weil are in this section of the large group which attended presentations on the opening morning of Herman's gathering. 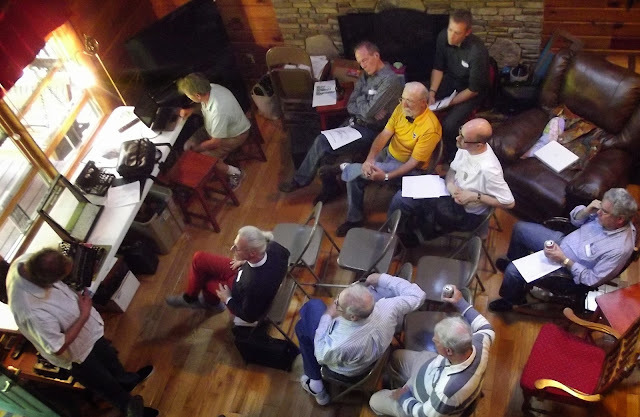 Going to America in mid-October and spending time among so many of the world's best-known and finest typewriter collectors and historians proved to be one of the truly great experiences of my whole life. 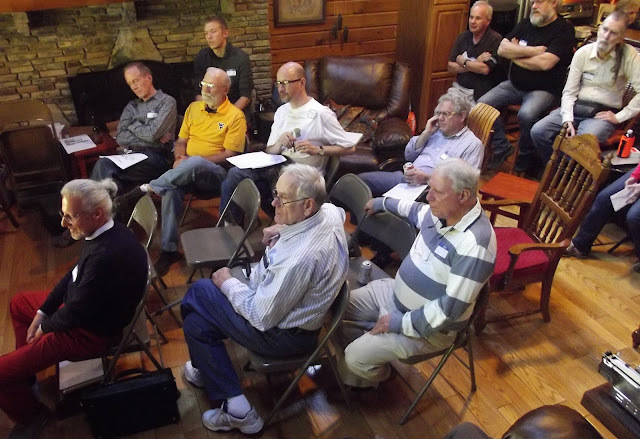 Being hosted by Richard Polt in Cincinnati and Herman Price in West Virginia, and also being able to meet the like of Will Davis, Peter Weil, Martin Howard, Paul Robert, Marty Rice, Mike Brown, Alan Seaver, Dennis Clark and Jim Rauen, was something I shall treasure forever. I was the first Australian in 12 years to attend a Typewriter Collectors' Gathering in the US, but I am guessing there will not be such a long break before another Australian Typospherian makes the effort to get to one of Herman Price's gatherings at the Chestnut Typewriter Museum in Fairmont, West Virginia. This trip must surely now be on the bucket list of all typewriter lovers. 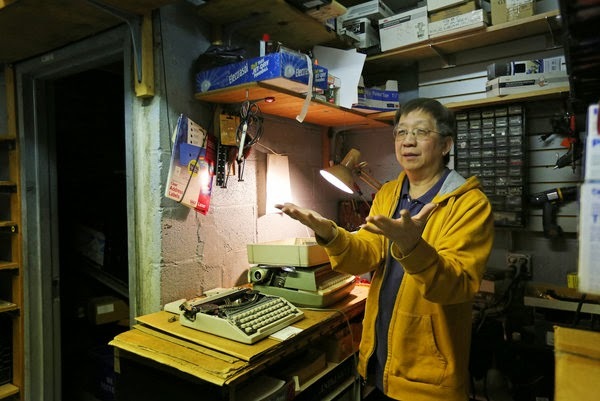 The New York Times last Friday ran this photo with a story ("Finessing Typewriters for Nearly 40 Years, and Now Turning Over the Keys") about New York City's retiring typewriter repairman Bino Gan. Based on an article which appeared in The Villager last month, I flagged Bino's retirement in my Typewriter Update for November. Bino owns (at least until tomorrow) Typewriters ’N Things in the West Village. On Christmas Eve I received a charming email from Rupeshi Shah, a senior at New York University, saying she had been inspired by my blog post item about Bino to make a broadcast news class interview. Her short video profile is here. Rupeshi wrote, "I wanted to share the piece with oz.Typewriter, as your article is what made me aware of him, and I really appreciate it. I would love any feedback you may have, and I thank you for the inspiration." Bino Gan of Typewriters 'N Things (profile) from Rupeshi Shah on Vimeo. 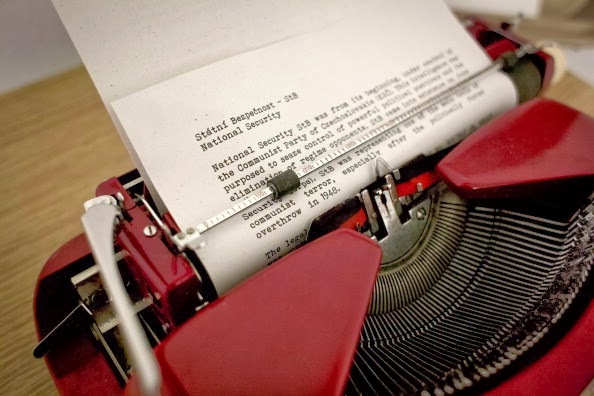 In Prague in the Czech Republic, the week before Christmas, a small portable typewriter was displayed showing text relating to State Security (Státní Bezpečnost, or StB) in the former Czechoslovakia. 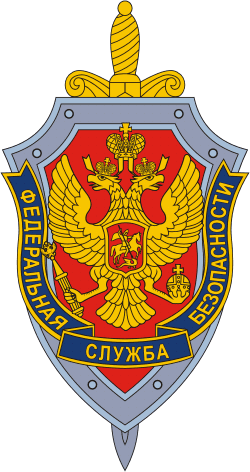 StB was a plainclothes secret (political) police force from 1945 to its dissolution in 1990. Serving as an intelligence and counter-intelligence agency, it dealt with any activity that could possibly be considered anti-communist. The little typewriter is part of an exhibition in a Cold War-era nuclear shelter inside the Hotel Jalta on Wenceslas Square. The hotel has opened the hidden underground bunker to the public to mark its 55th anniversary. The secret shelter was built in 1958 and was used to carry out surveillance operations and monitor conversations of visitors to the hotel. Its ventilation system and concrete reinforcement was intended to provide protection against radioactive contamination, nuclear explosions and aerial bombardment. Two's company, three's a crowd. But do three Typospherians gathered in the kitchen of a Typewriter Museum constitute a Type-In? If so, Canberra staged its first Type-In this evening. It wasn't even vaguely approaching the same league as the impressive gathering of luminaries for the Californian Type-In at Berkeley on Friday, obviously, but it was a lot of unscheduled fun nonetheless. Fellow Canberra Typospherian Jasper Lindell ("DHIATENSOR") called over to meet, for the first time, Brisbane's Scott Kernaghan ("The Filthy Platen"). Scott and Miss Jane are on a flying two-day visit to Canberra, after having spent Christmas in Melbourne. They are due to start the return journey to Brisbane tomorrow. With Scott and Miss Jane here to celebrate the relaunching of the Australian Typewriter Museum's displays, Jasper joined Scott and I in an impromptu "Type-In". A wide variety of machines from the displays were used. Scott on a Royal 10, Jasper on a Remington International. Scott on a Rheinmetall, me on a Hermes 2000 and Jasper on an Alpina. Richard Polt gave me a spare parts Standard Folding when I was in Cincinnati. The decal had worn off, so for the weekend I relabelled it a "Scott Kernaghan Folding Typewriter". Scott seemed amused by my little joke. Scott tries out THE Masspro! Royal Standard 1 and an unoccupied Senta. Jasper masters an Imperial Good Companion 7, Scott on an Underwood 3 and me on an Antares Domus. A big thank you to Miss Jane for photographing and filming this brief but highly entertaining event. Susie wasn’t Raymond’s sister, she was the figment of a bright young mind, one already well capable of composing charming little notes and letters, if occasionally lacking in spelling skills. Mama was Anna, nee Hauser, of Tony, Wisconsin, whom Anton Koessler had married in 1889. I now own Raymond’s Simplex Special No 1 typewriter. I won it on an eBay auction. It came to me in almost perfect condition, except for a small ink stain on its wooden base. The paint has not worn in the least, and its black box looks almost as new as it did that 1913 Christmas Day morning when Raymond first opened it on his family’s farm. 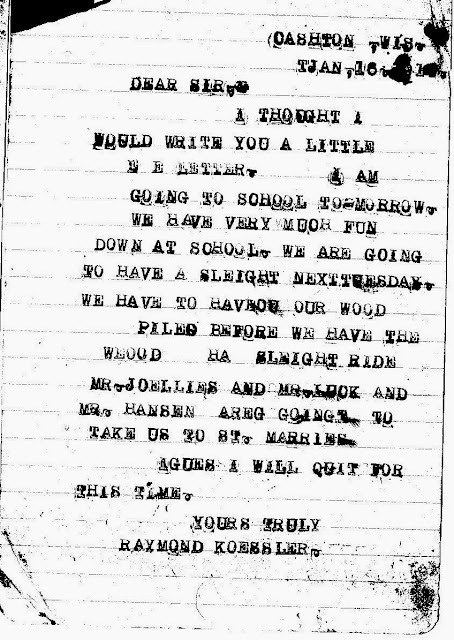 It came with the tiny ink bottle Raymond used, and, best of all, it came with all his letters and notes. 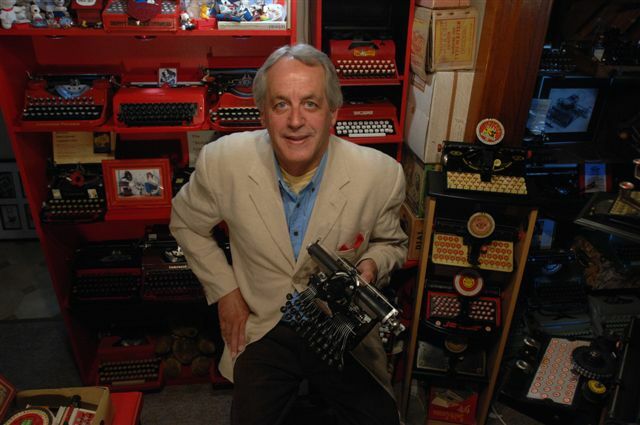 Raymond’s Simplex takes pride of place among my collection of toy typewriters. I wanted to know more about the boy who had once owned my Simplex Special No 1. So I contacted Jeanne Hesselberg, a photographer and writer from nearby Sparta. She kindly put me in touch with Dr Jim Brown, a Wisconsin rail historian, who passed my query on to Jarrod M. Roll, the Monroe County historian at the Monroe County Local History Room and Museum in Sparta. Jarrod Roll was extremely helpful, sending me details about the Koessler family and Anton’s obituary. 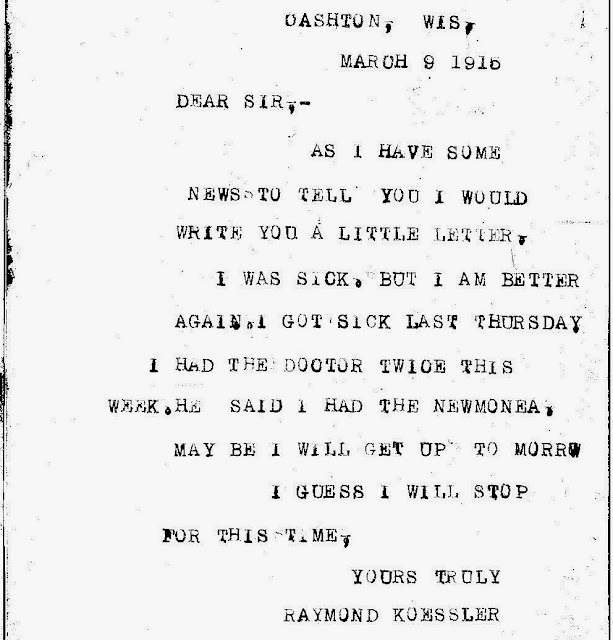 Jarrod deeply saddened me, however, by telling me Raymond had died, in the year of the Spanish flu epidemic, 1918, aged just 14. * This typewriter will soon join Herman Price's massive Blick collection in West Virginia.